Caption slip reads: "Photographer: Forbes. Date: 1953-02-19. Reporter: McMahon. Assignment: Bennett, gum betting marker case. 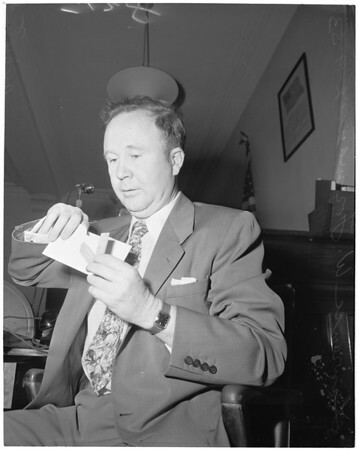 127-128: Deputy Municipal Court Clerk Laurence W. Foreman holding two sticks of gum used as betting markers. Monday."